I would also like to know why this is not as popular as Salt bridge experiment (Is this an inefficient way of producing electricity?) I was unable to find much resources on these kind of setups(Without salt bridge) on the internet. Changing a few words may make the situation clearer. There are three reactants: 1) Zn, 2)Cu and 3) H2SO4. Actually, the Cu does not change, so it is not really a reactant, but it is part of the overall reaction. What happens when Zn is placed into acid: some Zn atoms dissolve to become Zn++ ions, and they leave their electrons behind, so the Zn electrode become negatively charged. H+ ions may be attracted to the electrode, but there are barriers to formation of H2...too complicated for a simple discussion. 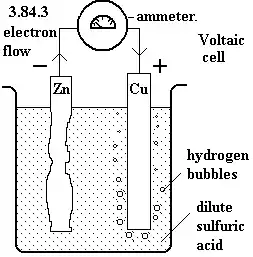 But if you lead the electrons to a different electrode (like Cu), H+ ions can come closer to the electrode, and more easily form H2 molecules which will rise to the surface of the solution. I would say not that electrons are attracted to the Cu, but rather that they are forced there by the negative voltage developing on the Zn. Why don't the electrons combine with H+ near the zinc strip? Zinc (especially pure zinc) is said to have a high hydrogen overvoltage. This means essentially that H2 is not formed and evolved as easily as theory suggests; it could be that a monolayer of hydrogen is deposited, but is stuck to the Zn surface as atoms which do not combine to H2 easily - you have to force them by forcing on more H+ ions. And hydrogen evolution eventually happens even with ordinary zinc because there are always tiny imperfections in the surface which can more easily permit 2 H atoms to combine to H2. 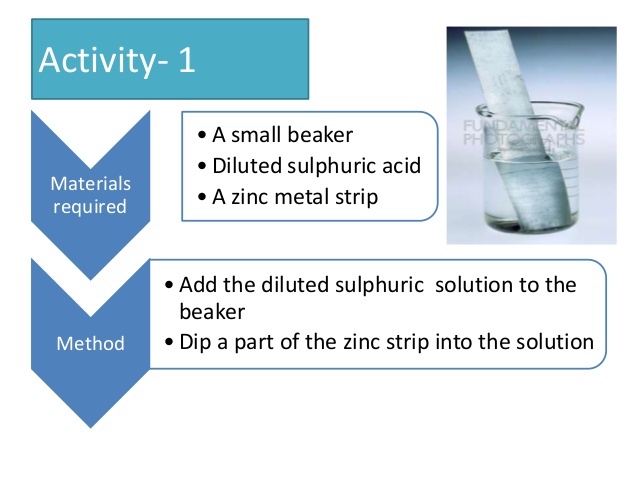 In past days, a very thin surface coating of mercury was applied to zinc electrodes in order to coat these surface imperfections and reduce the ability of the zinc to evolve H2. Perhaps the Salt Bridge experiment is a way to more clearly separate the two reactions of Zn dissolution and H2 evolution. In real batteries, salt bridges are not used. They would give extra resistance to current flow and reduce energy output. Why do electrons follow from Zn to Cu but not Cu to Zn in the lemon battery experiment? Does it matter what electrolyte we use for a Galvanic Cell?